WordPress is currently one of the biggest CMS and blogging platforms. But why is that? WordPress has been criticized a lot over the last few years. One of the biggest issues is that the architecture isn’t as modern as it could be. The way the platform (or CMS) was written in 2004 is different from the standards we see today. Despite this, there’s no doubt that it’s very easy to use for end-users. End-users want a CMS that’s easy to publish content with. I believe that most users don’t want to hard-code their content. 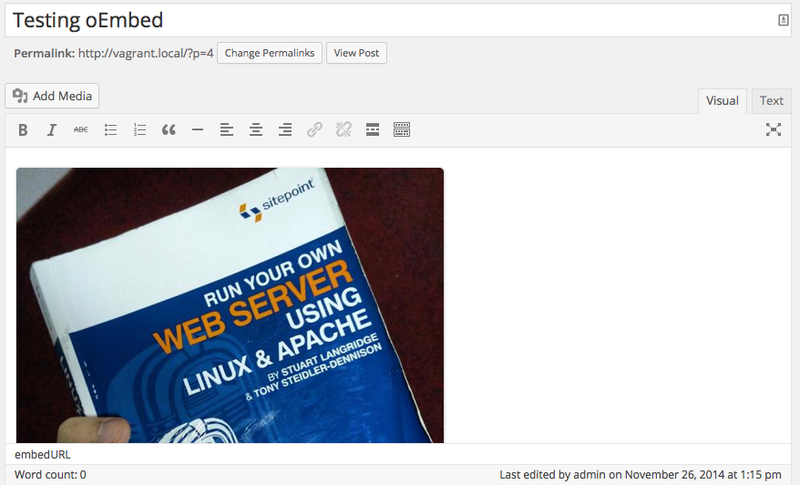 If a client asks me: “I want to add some content from SlideShare”, my mind goes to REST APIs or at least embed codes. Today we’re going to look at a feature of WordPress that you’ve probably used without even knowing it. oEmbed is an incredibly easy way to embed content in your site. oEmbed consists of a consumer and a provider. The provider provides resources that can be embedded on the consumer and the consumer requests those resources via the oEmbed endpoint. The Photo, Video and Rich type should provide a URL, width and height in their response. The providers can include also other data, but these are all that’s required when dealing with this type of content. The oEmbed specification is a guideline, providers can do their own implementation of oEmbed. The provider should have at least one oEmbed endpoint and a resource URL. Let’s take a look at the SlideShare and see how they have implemented oEmbed. In their documentation they specify the oEmbed endpoint and the resource endpoint. The oEmbed endpoint is: http://www.slideshare.net/api/oembed/2. The resource endpoint looks something like this: http://www.slideshare.net/user-slug/slidename-slug. To get the information from the provider, we should use the oEmbed endpoint and pass a URL parameter of the resource. The parameters should be URL encoded. The minimal requirement is the URL parameter, but you can also pass maxwidth, maxheight and the format. It really depends on the content format, but for Video, Photo and Rich format you have the option to pass these arguments. Also, oEmbed only specifies the GET method, so you can’t use other methods. Let’s make a request to this endpoint using the URL parameter. If you request only the URL value in the browser, you’ll just get a normal HTML page. Something you see everyday. SlideShare defaults to XML format if no other format is requested. Let’s change the request a bit. This time we’ll add another parameter and get a JSON response. If you compare the width of the iframe on html key of this request with the previous request, you should see a difference. The first one had a width of 427 and the last one had a width of 202. If you want to know more about the oEmbed specification, take a look at the official oEmbed docs. Also take a look at the SlideShare oEmbed documentation and play with it a bit to better understand how it works. For a moment, let’s forget about the technical implementation. WordPress is more about end-users. All the implementation of the oEmbed specification is inside the WordPress codebase. 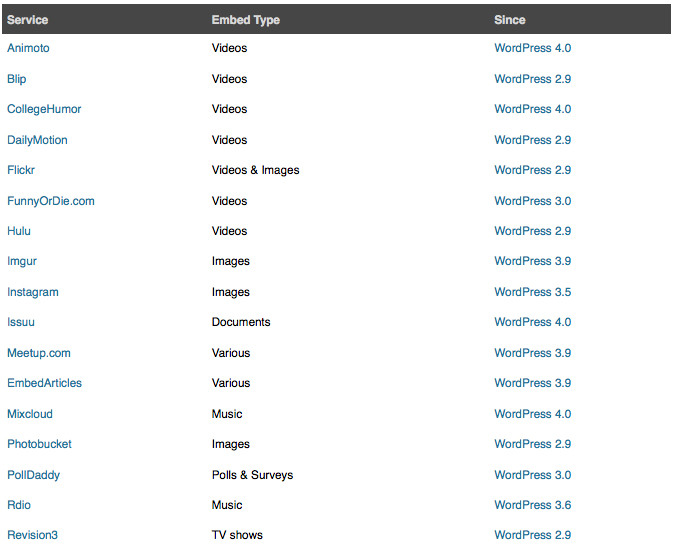 WordPress has a white list of all the supported oEmbed providers. These are just some of them from their whitelist. WordPress makes easy to embed content from this whitelist. Just paste the URL of one resource when creating a post or page. The URL should just be one line on it’s own. WordPress looks for that link and then searches to see if this link is a resource for one of the whitelisted URLs. If it is, then it makes a request to the oEmbed endpoint. 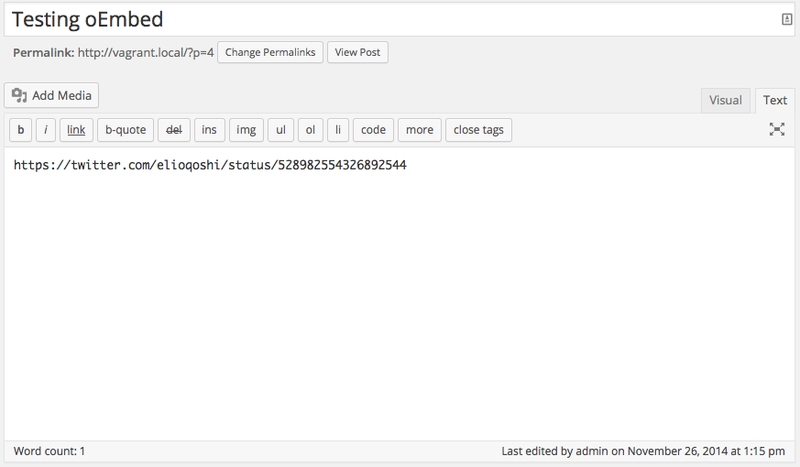 In this example, I copied a Twitter status URL and WordPress embedded that status for me, inside the post. But this is not limited only to Twitter, search for other sites in the whitelist and experiment with them. Beyond the whitelist, every oEmbed site is supported by WordPress. You can manually add additional providers. WordPress provides two functions, one for registering a site that supports oEmbed and one that we can hardcode to add oEmbed support to our site. Use wp_oembed_add_provider() to add an existing oEmbed site to WordPress. You can also use wp_embed_register_handler() to add an non-oEmbed site. Or, if you’re like me who hates to reinvent the wheel, you can also check if a plugin exists first. oEmbed is one of the handy WordPress features that makes your life easier. In this article we covered what oEmbed is, we looked at the oEmbed specifications and how oEmbed and WordPress work together. But don’t stop there. Experiment with the whitelist and extend it with your own providers.